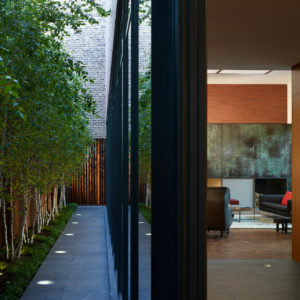 Designing this Chicago residence was an exercise in creating a sense of privacy within an urban neighborhood, while providing an abundance of open, bright space. 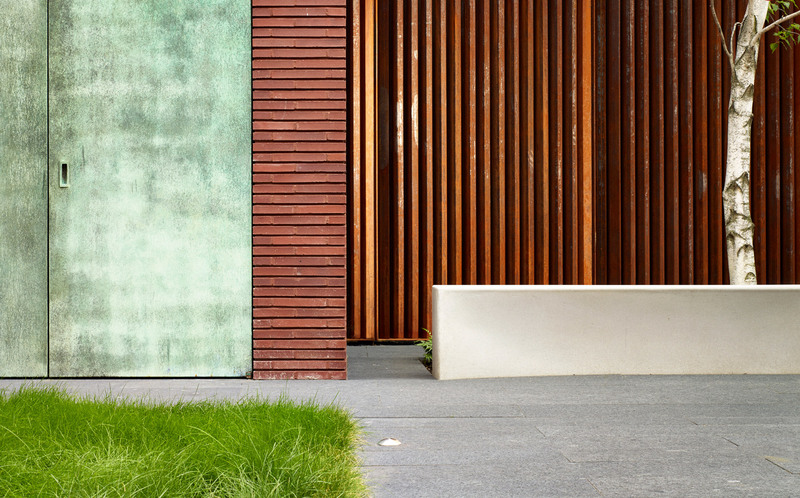 The first thing to catch the eye when approaching the house is a copper screen draped over the east-facing windows. 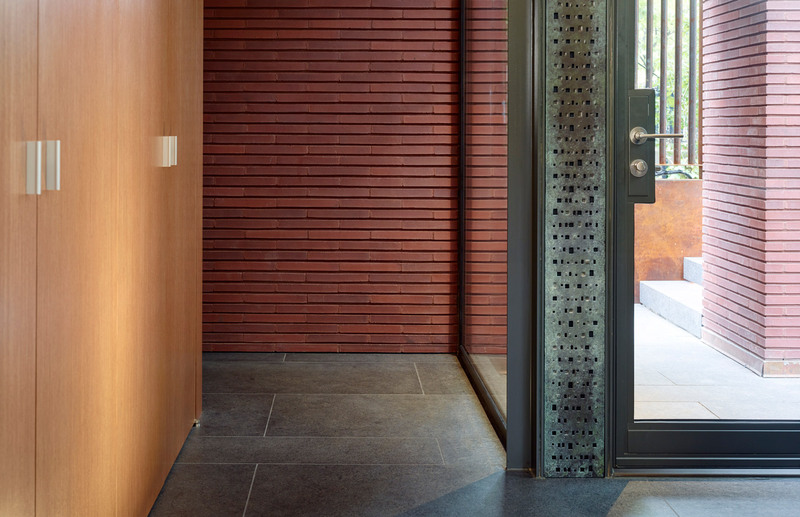 The house is organized in an L shape, and the copper screen wraps around one leg on four sides. The panels were framed and mounted on the exterior and interior of the residence as aesthetic elements. 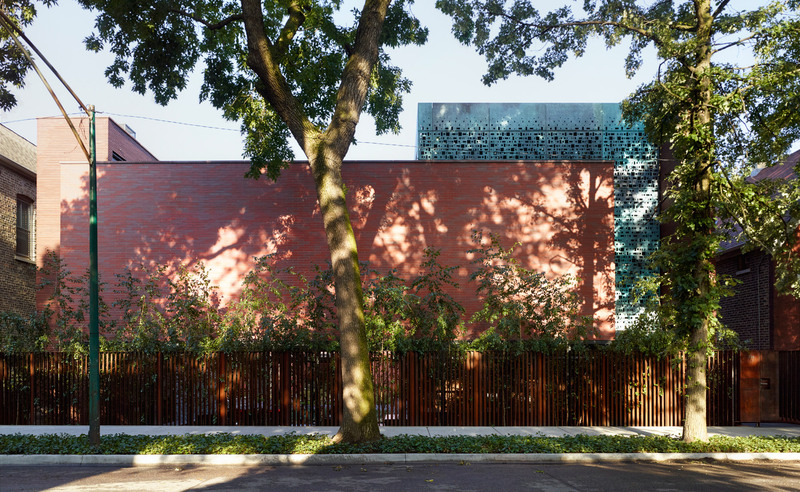 Large format panels of copper were embossed, perforated and an aging patina was applied. 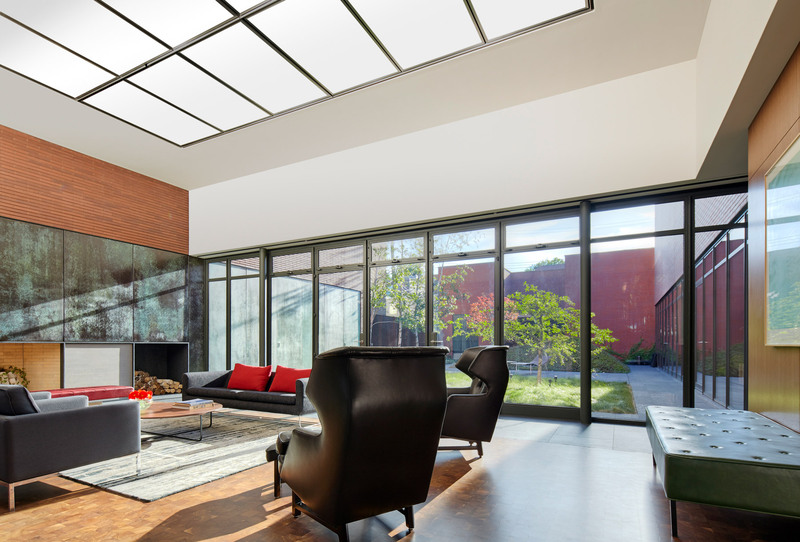 This element was conceived as a means of permitting ample amounts of natural light into the second and third floors while maintaining privacy for those spaces from the street. 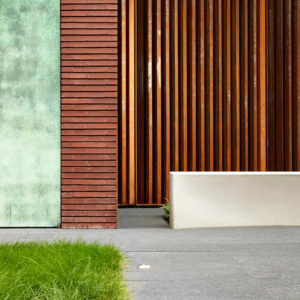 The copper elements line the north and south sides of the courtyard, again connecting the house from front to back, outside to inside. 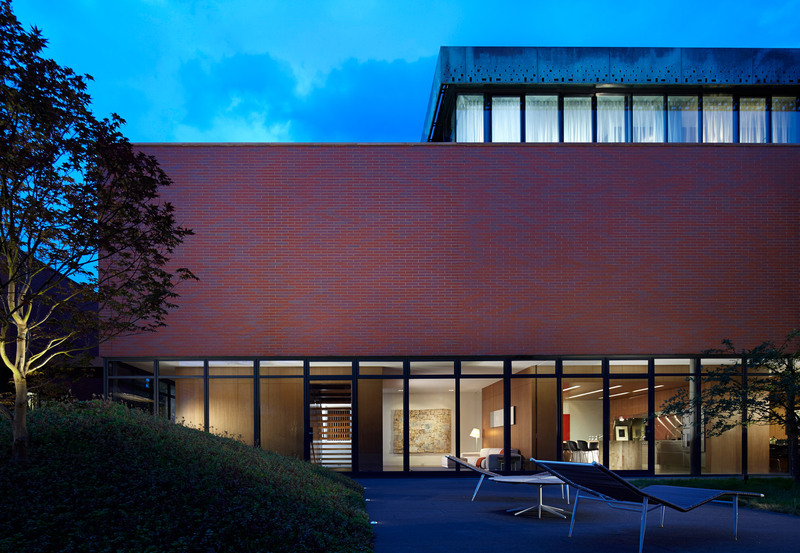 Together with the brick masonry, steel, glass, stone and landscape, the materials create a serene and distinctive environment. The screen is composed of individual panels designed with a custom pattern of square and rectangular perforations and embossing. The pattern varies in scale and arrangement across each panel. The individual pieces are hand-treated with multiple layers of patina to arrive at the custom blue-green and bronze finish. 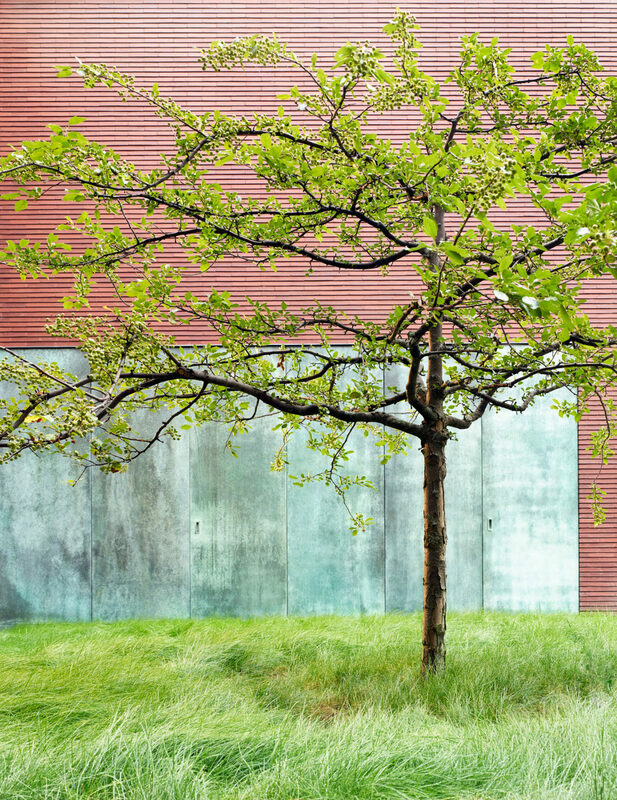 When taken together as a whole, the result is a rhythmic constellation across the façade. The individual panels are attached to a concealed steel frame supported by the main structure of the house’s roof. 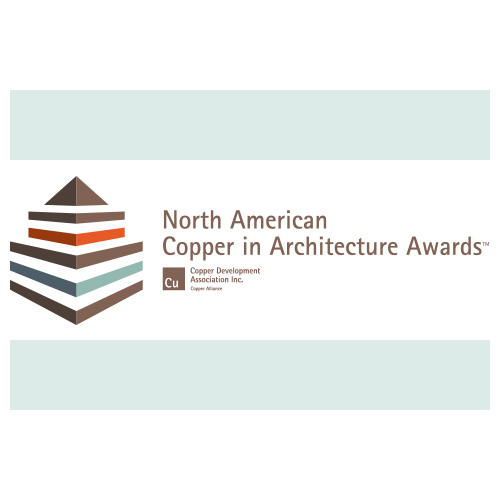 The general contractor and copper fabricator worked closely with the architect to develop the framing system and minimize its appearance behind the panels. 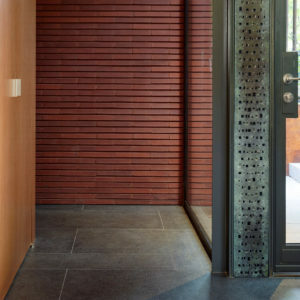 Copper was selected as an integral design element at this residence because it has a number of intrinsic properties that the homeowner and architect both valued. Aesthetically, the inherent nature of the metal’s patina to evolve over time was an alluring quality. 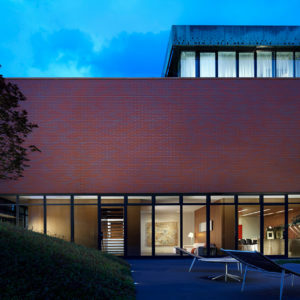 Structurally, as a versatile light weight metal, it adapted well into the architect’s unique modern design. Lastly, the metal’s properties of durability, corrosion resistance and low maintenance made it ideal for use on an exterior. The first floor is defined by floor-to-ceiling views from the garden in the front to the courtyard at back — from living room, to kitchen to media room. The second floor has private spaces with northern and eastern light, appropriate for comfortable sleeping spaces. The third floor provides solitude for working and adjacent outdoor areas of repose that encompass views over the courtyard, the neighborhood and to the city skyline. 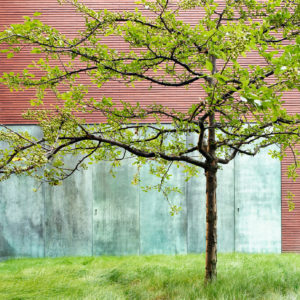 Together, they comprise a rational and inspiring response to basic needs of living, sleeping and working. 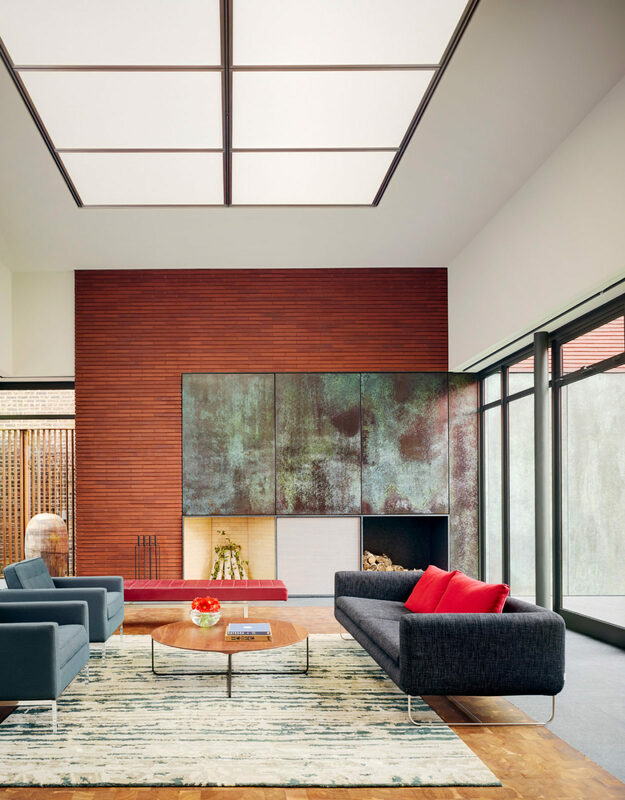 Inside the house, large copper panels with a similar hand-weathered patina surround the fireplace and serve as the aesthetic backdrop for a two-story living room volume. 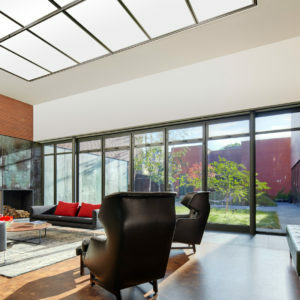 A large lay-light of patterned acrylic filters natural daylight from the skylight above. Full-height windows and doors line the east and west sides of the room. 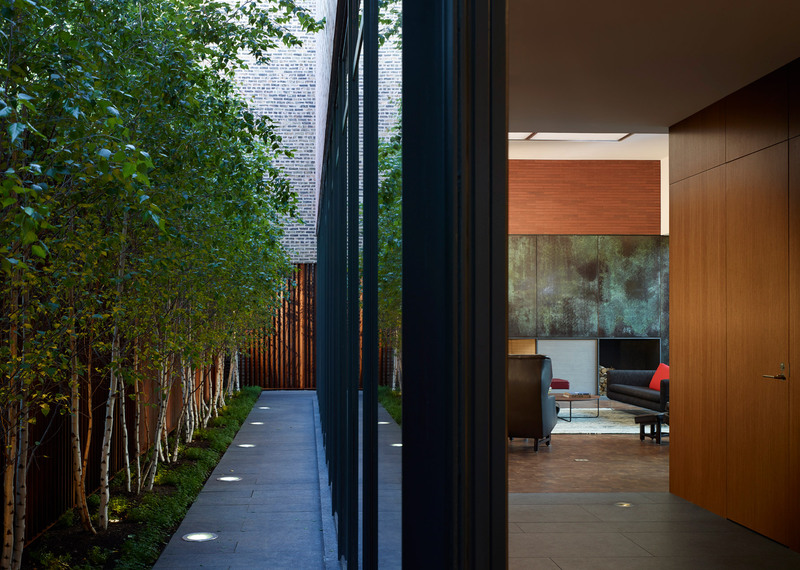 These openings, together with the birch trees planted along the front fence and the visual depth of the courtyard, create an experience of seamlessness between indoors and out – which is highly unusual in an urban residence. 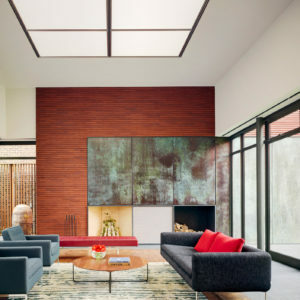 The copper panels that hang above the fireplace reinforce this experience as they continue to the exterior, where two panels are operable for outdoor storage and stair access to the roof deck. 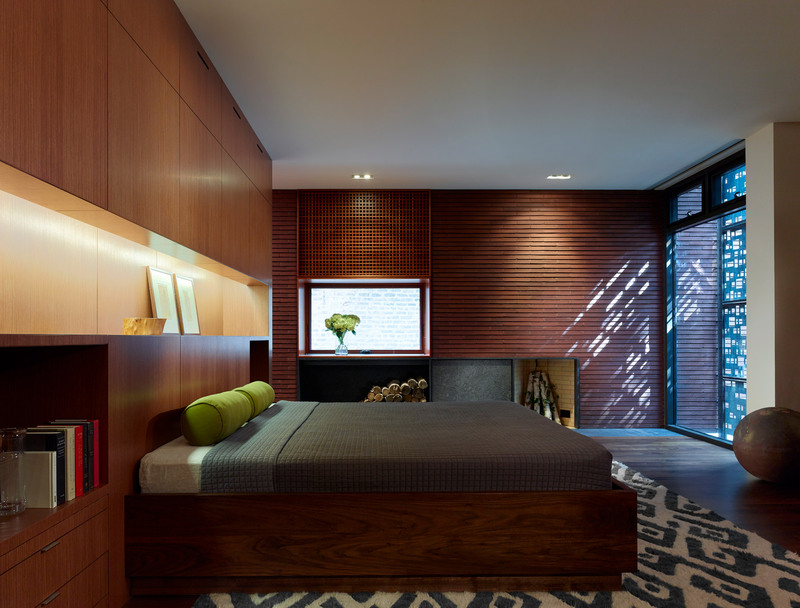 On the second floor in the master bedroom, one window is floor to ceiling glass and faces east, overlooking the street. 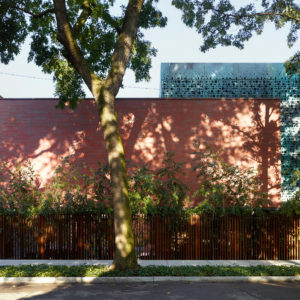 The perforated copper screen on the front façade covers this window, as it does the east-facing third floor windows, providing privacy while allowing eye-level views to the street and an articulated pattern of natural light into the room.